Luckily, I had to be in Beijing this week for business, so we made time to visit the Great Wall one last time–my fourth visit. After a rainy travel day yesterday, today was blue skies, clean air and cool weather–WHAT??? IS THIS BEIJING, REALLY? Patti and Larry, our visitors, think we are lying about the pollution in China because since they have come, it has been the best weather of the year. Perfect time to visit China is late September/early October while the trees are still green, the coal heat isn’t being used yet and the fields of corn aren’t being burned yet after the harvest. There is a this very narrow window of normality that I am sure all citizens rejoice and revel in. I know we are! So, we set out at 8 a.m. for the Great Wall with our driver, who saved our lives not once but TWICE when he swerved to avoid the crazy drivers who had missed their exit and then decided to dead stop on the highway to back up. Thank you driver! I was sitting in the middle of the back and holding onto Patti for dear life because I had no seat belt. Safely arriving, the new Great Wall Guest Center was barely busy with all the new shop areas just coming to life. They sadly are opening a Burger King in the complex-yuck! 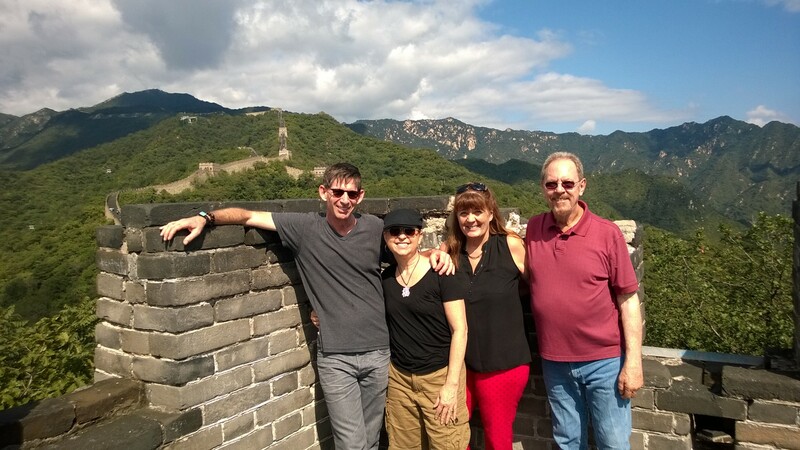 Sharing the Great Wall with our friends, Patti & Larry, was awesome. After the lovely climb to the top on the ski lift, we climbed and enjoyed taking lots of pictures, though we can’t possibly take more than our local friends who can pose for what feels like hours when we are waiting to use the same space. Get on with it, folks! Snap the photos and move on. One couple actually dragged the huge wedding dress to the top to take their wedding photos. Can’t imagine the coordination or how the bride had to probably change into it to keep it clean. Amazing what you will do for a cool wedding photo! SO FUN! Toboggan your way down the mountain! After traipsing up and down the crooked, leaning, worn steps through several gatehouses, we proceeded to the most anticipated part of the trip–tobogganing down the mountain. I’ve done this twice before and it is FUN! The crazy local group who had hogged the best spot to take photos was just in front of us. I warned our group to wait because I just knew they would stop mid-mountain to take a few photos and they surely did just that. Thom was screaming at them to move on so we wouldn’t plow into them but we had to stop on the slide and wait them out. A lovely couple from the Netherlands behind us thought me insensitive as I screamed at the top of my lungs, “GO. DAMN. IT!” several times but I reassured them that I live in China and locals would only understand this type of communication. Thom decided to let go of the brake and see how they liked to being bumped forward-the ugly NYC cab driver in him oozed out. FINALLY, with us and the track workers yelling at them to “GO,GO, GO” they went, smiling all the way having held up dozens of people but they got their pictures and that’s all that mattered to them. After some bargaining for more presents (Patti is getting as good or better than me! 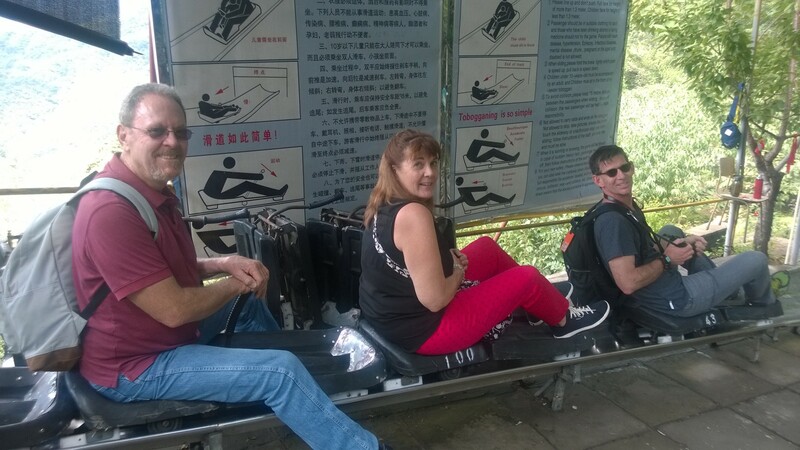 ), we started on the two hour ride home-I won’t miss Beijing traffic for sure but I will miss the Great Wall. 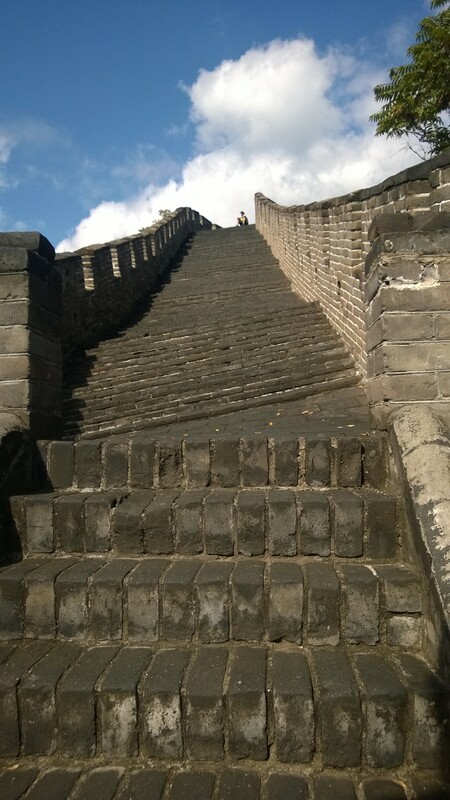 There is nothing like it and I will always be in awe that I got to experience it not once but four times while I lived in China. WOW!